There are many challenges unique to designing a building for an indoor pool. Before starting this project we visited similar facilities in the area to learn what their biggest problems were and learn about their solutions. Then we talked with the physical therapists to get a complete understanding about the needs of their clientele and determine ideal temperatures for both the water and room and the range of water depths needed in the pool for their activities. This allowed us to pre-solve all challenges as we developed the design and infrastructure systems. The exterior view of the building features large expanses of glass walls that are the outside of an interior wall perimeter. The interior perimeter is also an expanse of glass walls that combine to form an inside walking track corridor. 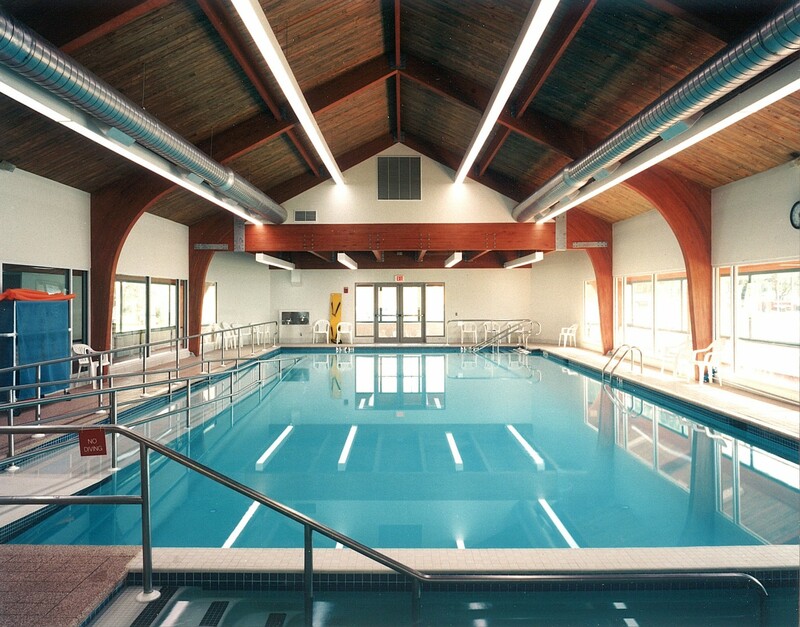 This double expanse of glass acts as storm windows to reduce condensation on the interior glass walls, reduce solar heat gain, and allow those in the pool to have a feeling of being outdoors without being seen by anyone from outside the building. 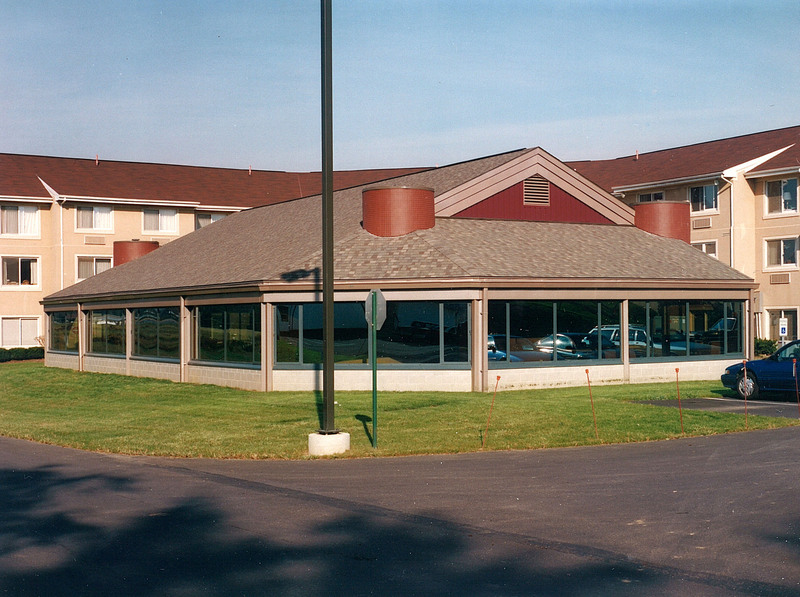 The round turrets on the roof attractively conceal the HVAC and ventilation equipment in architectural elements that enhance the overall appearance of the building. The walking corridor is a brightly lit area that provides simultaneous interior views of the pool and views of the outdoors. Poured seamless commercial athletic flooring was used to make it easy for people of all abilities to use the space for exercise. 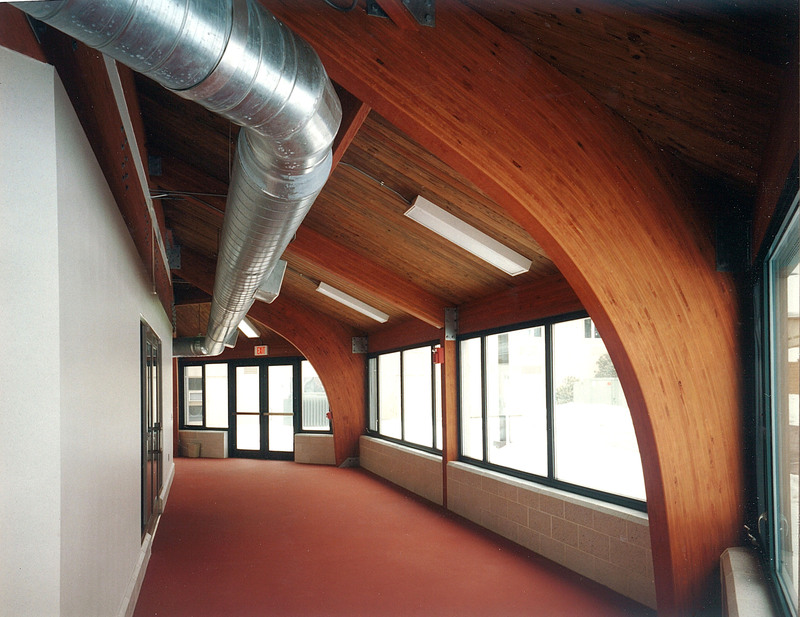 The glue laminated wood arches and wood roof deck are rich-looking elements of interest in the area that are actually low-cost design solutions. Ceiling lights are mounted to also reflect off the exposed mechanical conduit that runs along the interior wall. 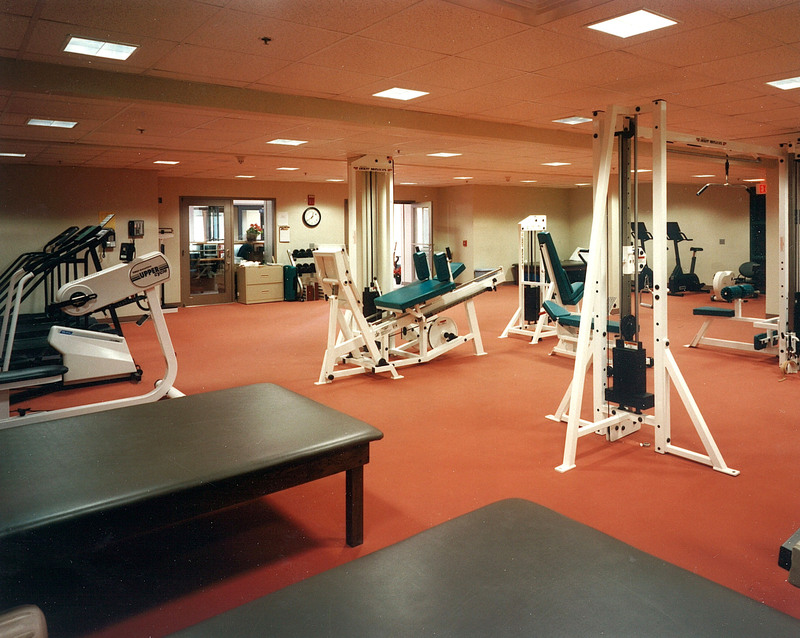 Adjacent to the therapy pool is a large physical therapy room filled with a variety of exercise equipment. We continued with the athletic flooring in this area as well, but used a ceiling that would absorb noise and contain a softer ambient light. Staff can keep an eye on the activities from their office with a full glass door and window that connects it to the exercise area. Combination bathrooms/shower rooms/locker rooms, one for men and one for women, are conveniently located between the pool area and the exercise room.